Moodle is undoubtedly the most popular open source LMS option available today. 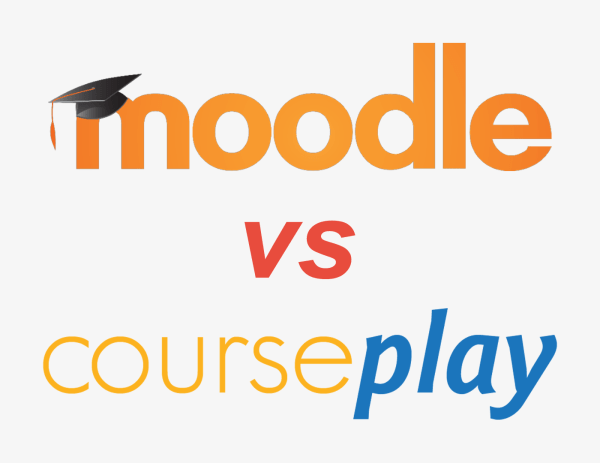 At Courseplay, we regularly get asked the same question: How does Courseplay compare to Moodle? The primary difference between Moodle and Courseplay is that Moodle was originally developed to be a free learning management system (LMS, in the traditional sense) for educators to administrate schools, with a focus on collaboration and continuous development. Courseplay, on the other hand, was conceived as a scalable cloud-based enterprise training solution for organizations rather than exclusively for schools and colleges. In recent years, due to the popularity and seemingly low-cost of Moodle, even medium and large businesses have attempted to use Moodle, or a customized version of it, to manage their online training programs. In certain situations an open-source self-install option may be the best solution, however in many situations it will make better sense to use a professionally developed and managed cloud-based solution like Courseplay. In this post we will explore the biggest differences between the two. As Moodle is an open-source application, you only get the latest source code from them. This means that you either need someone within your organization to install, manage and maintain Moodle, or you need to contract a third-party vendor to do it for you. While the idea of “open source” and “free” may allure you at first, the costs associated with installing, configuring, hosting, managing and maintaining Moodle quickly add up and can come as quite a shock to those unfamiliar with how web applications work. While you might be able to digest the cost of hosting the LMS and even manage to get someone to set everything up for you at a reasonable price, maintaining the application is a permanent, tedious and sometimes costly endeavor, especially if you or your vendors decide to customize or make changes to the source code to suit your own needs. Moodle is frequently updated with important security patches and useful features, which make it tedious to update on a regular basis if you have customized code, which is often the case. All your changes will have to be redeveloped (or at the very least retested) each time a new version is released to be compatible with the latest version of Moodle. You can choose not to do this, but then that means you are choosing between having a light LMS with the latest updates or a heavily customized LMS with slow, periodic updates. While there is plenty of documentation available online along with a large and helpful community, each server environment can differ greatly to the point where it is a unique scenario each time, and a solution for one person may not be a solution for another. If you do go with Moodle, make sure your in-house development team or third-party vendor is properly skilled to do the job. Third party vendors may cut corners. Unless they specialize in Moodle development, third-party vendors are unlikely to have 100% familiarity with such a complex platform. A trusted team to constantly test the platform would also be highly recommended. Support is a big deal. Users have to be trained on how to use the software. In case assistance is needed, or a bug is found, someone has to be there to resolve the problems. With Moodle you have a large community of users who may or may not reply on a timely basis on the forums. Getting a dedicated trainer to train your team on how to use Moodle may be available but they are hard to find and may sometimes be expensive. If you wish to use Moodle for real users and not just experimentation (in the software world this is known as a “production environment”) you will need a server. Servers cost money, not just to own or rent, but also to run and administrate. In addition, Moodle was not built to support a large number of users, which means you will need to incorporate a scalable server architecture to keep your costs down but also support hundreds or thousands of users during peak hours. If you use SCORM content, this makes things very complicated as SCORM does not support “cross-domain” functionality, making auto-scaling nearly impossible (or at the very least extremely expensive) to accommodate. Make sure your third-party vendor has a solution for this. There is also the administration cost. Each installation of Moodle is separate and must be managed and updated separately as Moodle is a “single-tenant” application. If you need Moodle for multiple organizations, make sure you are ready to bear the cost of multiple installations and maintenance contracts. The minimum total cost for you over three years would come to INR 8-12 lakhs for something that will be outdated within 1 year if not sooner. The payment for the services associated with Moodle are likely to me lump-sum amounts, paid to service providers each month, quarter or year. In stark contrast, Courseplay is a cloud hosted and fully-managed online training platform that can integrate with your existing IT solutions (e.g. HRIS, ERP, CRM, etc). The team that is developing features based on your requirements is the same team developing the core software. So you are guaranteed to be in safe hands. Beyond that, our support team takes care of everything for you. Think of us as your very own Chief Learning Technology Officer. Setting up Courseplay for your organization literally takes 30 seconds. No fuss. Plus, you pay for what you use on a monthly basis, but annual plans at a steep discount are also available. At Courseplay we charge only based on the number of Active Users each month. No Active Users means no charge. We also offer additional services at reasonable rates, the full list of which can be found here. With Courseplay we have a dedicated team of relationship managers and tech support to handle any request. In the past we have even helped clients perform maintenance of their own servers because they needed it to be done urgently and we stepped in because we like to see our clients happy. Moodle in its original form is great for small schools, or other organizations that wish to experiment with online training and have a steady volume of users each month. We recommend stock Moodle for educational institutions and other organizations with not more than 500 registered users at any given time. Depending on the environment and configuration, more users may be supported here. For large corporations or professional organizations with more than 100 active users in any given month that need security, stability and scalability, we recommend a cloud-based Software-as-a-Service offering. In this post we have specifically discussed how Courseplay compares to Moodle, and we are biased, but an objective answer would be that any cloud-based corporate training platform would probably be better than Moodle in this particular situation.